In early April, Dolicious Donuts in British Columbia, Canada created the Donutopia for its grand reopening. For 40 years, the business was known as Wineyard Bakery and Deli. What better way to unveil its new name than a $100 doughnut? The inspiration for the luxurious treat came from a loyal customer who wanted to propose to his girlfriend by putting the engagement ring in her favorite cream filled doughnut, but the bakery owners took it to the next level. 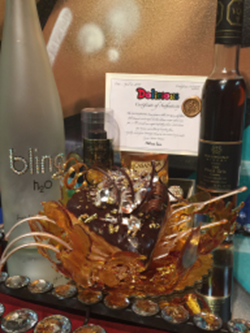 The Donutopia includes edible 24-karat gold flakes, edible sugar diamonds, local ice wine, Bling H20, a chocolate topping made with aged balsamic vinegar and other secret ingredients. If you’re interested in trying the unique baked good, you need to order it 24 to 48 hours in advance. This isn’t the first time an expensive doughnut has made headlines. In May of last year, Krispy Kreme and Selfridges in England brought us the world’s most expensive doughnut to mark National Doughnut week. 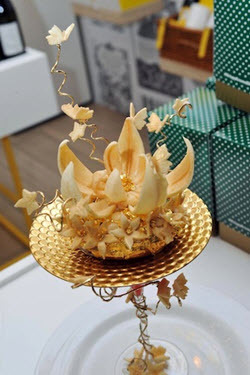 The doughnut’s worth is £1,000 ($1,500 US), and ingredients include Dom Pérignon vintage 2002 champagne jelly, a raspberry Chateau d’Yquem crème, 24-carat gold leaf and 23-carat gold dust and edible diamonds.